Natural Alexandrite Gemstones and Custom Alexandrite Jewelry. Featured Alexandrite limited-time offers. Only 306 gems left. A variety of Chrysoberyl, - Alexandrite is the must-have for the jewelry and gemstones connoisseur, featuring a color change from blue-green in daylight and purplish-red under incandescent light. Discovered in the middle of the 19th century in the foothills of the Ural mountains in Russia, the original Alexandrite deposit was the only source of gemstones for many years and the Russian stones set the standard for this extremely rare and valuable gemstone. Today, there is almost no production of Russian alexandrite´s and almost all of the original Russian stones are in museums or private collections. But fine alexandrite´s have also been found in Sri Lanka, Brazil, Myanmar, Tanzania, Madagascar, Zimbabwe, and India. Each of these deposits can and has produced exceptional stones, which are available today. Alexandrite commands a high price equivalent to or even exceeding the price of gemstones like, sapphires, rubies, emeralds, and diamonds. And the price of alexandrite has risen in recent years due to high international demand, especially from Japan, but as a gemstone investment, alexandrite is a good choice because of its rarity, durability and distinctive historical significance. Looking for one of a kind custom alexandrite jewelry piece? 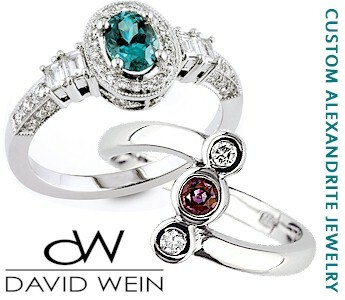 Please find your Alexandrite and visit our online jewelry workshop. Our approach to custom jewelry highlights the qualities of each individual gemstone to create a personalized design that enhances and respects the integrity of the stone. Call Now 1-310-594-5101 in USA or drop us an email and we will get back to you within 6 hours.